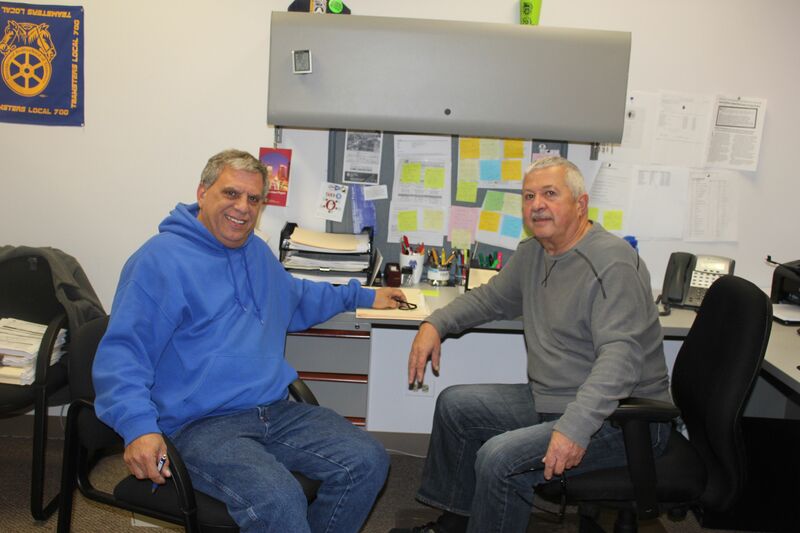 Joe Belli (pictured right) helps Vince Tenuto transition into the role of business agent. After more than 25 years of service as a Teamster representative, Local 700 Business Agent Joe Belli has decided to retire from the union, effective Oct. 20, 2017. Joe began his Teamsters career as a business agent and organizer for Teamsters Local 727 back in 1991. He had been working as a truck driver for 16 years and was a member of Teamsters Local 705 when he was asked to join the staff of Local 727. In 2008, Joe went to work for Teamsters Local 714 as a business agent and joined the staff of Local 700 in the same capacity at its formation in January of 2010. Teamsters Local 700 President Becky Strzechowski remembers meeting Joe when she was just starting her career at Local 727 as a teenager. Replacing Joe as a business agent to represent City of Chicago members is longtime CDOT member Vince Tenuto. Vince was previously a business agent and Vice President for Local 700 and has been a City of Chicago member for 20 years.